It’s 2019, the Nintendo Switch is hot off the heels of being the bestselling console of last year, and yet again we are getting another Nintendo remake on the 3DS, the geriatric grandfather of the Switch who simply refuses to die. In fairness though, so long as the 3DS can continue to host excellent games, there’s no reason for them to stop, and Mario & Luigi: Bowser’s Inside Story + Bowser Jr.’s Journey is indicative of this mindset. After almost a decade, the Mario & Luigi series favourite Bowser’s Inside Story is getting a second life on the 3DS, delivering addictive gameplay and a jovial narrative, alongside an additional game mode titled Bowser Jr.’s Journey that doesn’t succeed anywhere near as much. The story begins in the Mushroom Kingdom (no surprises there), where we are quickly introduced to the blorbs, a disease that has rapidly spread throughout the Kingdom, bloating Toads into gigantic balloon-like monstrosities. In order to find a cure for this illness, Princess Peach enlists Mario, Luigi and a Star Sprite named Starlow, who before setting off are interrupted by Bowser. After defeating Bowser in typical Mario fashion, Bowser encounters a mysterious salesman who offers him a mushroom that will grant him the strength to finally take down Mario. The mushroom however leads Bowser to uncontrollably inhale all objects in sight, so the cloaked salesman who turns out to be series antagonist Fawful takes Bowser to back to Peach’s Castle, where he swallows the Princess and the Mario brothers. The opening story segment is thoroughly entertaining, in part due to the witty dialogue of the characters, and it serves to justify just why the majority of the game takes place inside of Bowser. Having Fawful return to the series as the primary antagonist was a great choice, as his silly but crazy demeanour makes him an entertaining and hilarious villain. The narrative overall in Bowser’s Inside Story is interesting enough to keep you invested, but it’s the gameplay of Bowser’s Inside Story that truly shines. Mario & Luigi: Bowser’s Inside Story gameplay is truly outstanding, as it masterfully blends the commonalities of a turn-based RPG with that of an action-RPG. This melding of the two RPG combat types leads to battles never feeling stale, as you’re always required to be alert. For example, you can select a jump attack, and you will deal damage, but more damage will be dealt if you time the button press as you jump on the enemy. The ability to further damage enemies during turn-based attacks or while counterattacking incentivises you to master your attacks, as well as the attack patterns of the enemy, which adds another layer to what is already a thoroughly enjoyable battle system. 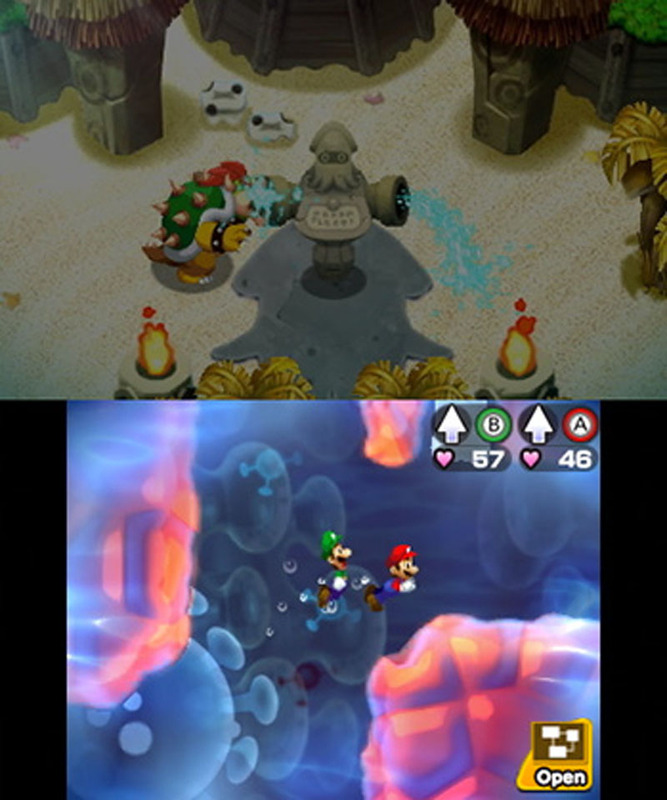 For the first time in the series, the battling extends to Bowser, and his moveset is vastly different to that of Mario and Luigi. Instead of sporting a jump and hammer, Bowser has a fire and punch attack, leading him to play differently to the brothers. 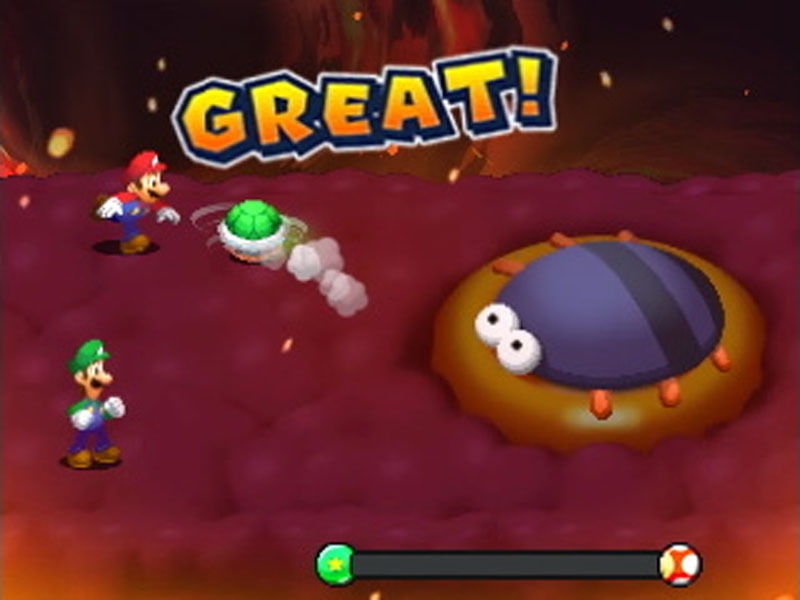 Considering Mario and Luigi’s attacks haven’t changed much since the first game in the series, having Bowser as a playable character is a welcome addition to the gameplay variety. When you aren’t in battle, you’ll either be making your way throughout Bowser’s body, or traversing the Mushroom Kingdom as King Koopa himself. Exploring the overworld is enjoyable, with quality puzzles and enjoyable mini-games strewn throughout. What I found really clever was the fact that completing certain objectives inside Bowser allows for Bowser to complete objectives he otherwise couldn’t. For example, for Bowser to lift a rock that is otherwise too heavy, the Mario brothers visit his arm and power his muscles, allowing him to lift it. 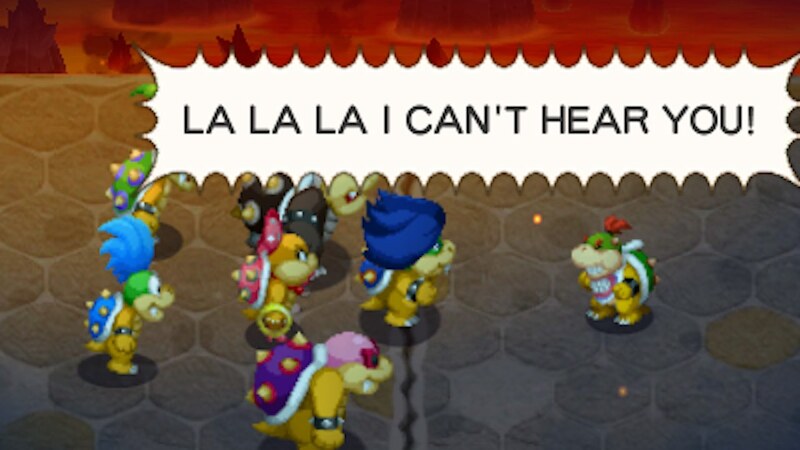 It’s the simple things like this that keep Bowser’s Inside Story so charming and engaging. Bowser’s Inside Story is top notch, but sadly the same can’t be said for the gameplay of Bowser Jr.’s Journey. Bowser Jr.’s Journey is a new additional mode that has been bundled in alongside the Bowser’s Inside Story remake, serving as a strategy game in which you battle a small team of Mario villains led by Bowser Jr. The mode consists of building up your squad of melee, ranged and flying enemies, who all have pros and cons against the different enemy types. Melee beats ranged, ranged beats flying, and flying beats melee. Fights are done automatically, with your responsibility being to craft a side with the perfect mix and formation of each type of fighter. 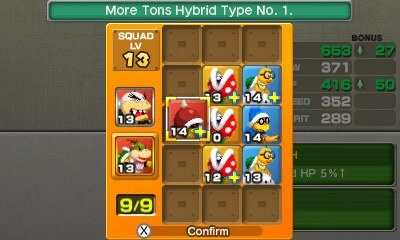 When it comes to Bowser Jr.’s Journey, I found myself frustrated over the lack of control I had of my minions. Yes, you do have to occasionally time button presses in order to inflict more damage, or press the touch screen to halt an enemy using a special attack, but overall I couldn’t shake the feeling that all I was doing was spectating battles of staple Mario minions. Bowser Jr.’s Journey is simply ok, and I think it’s fair to say that the mode was only implemented to add additional content to make the game seem more than simply a remake of Bowser’s Inside Story. 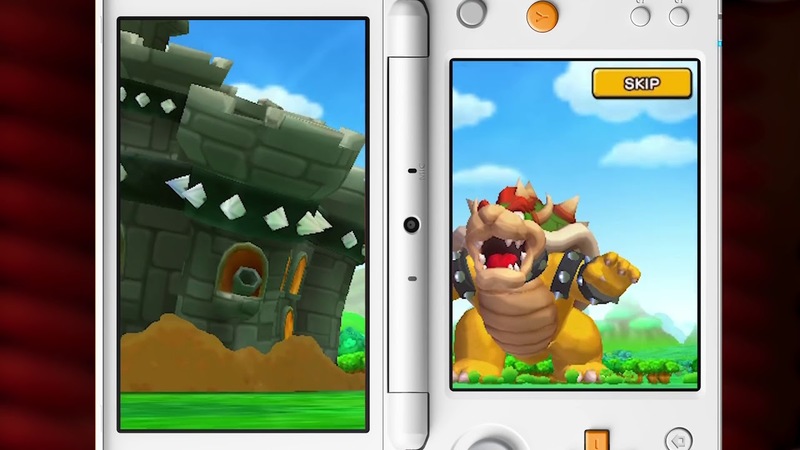 The story is decent though, running alongside the narrative Bowser’s Inside Story. Despite the incessant gushing about the brilliance of Bowser’s Inside Story, I do have a couple of minor nitpicks. 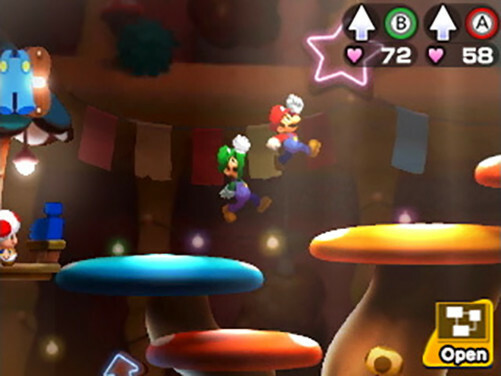 Firstly, the game feels a fair bit easier than previous entries in the Mario Luigi series, such as Partners in Time and Superstar Saga. This isn’t particularly a bad thing, but I couldn’t help but be a little disappointed that I made my way through boss battles with relative ease. Another miniscule gripe I had with the game in regard to both modes was the lack of 3D implementation. 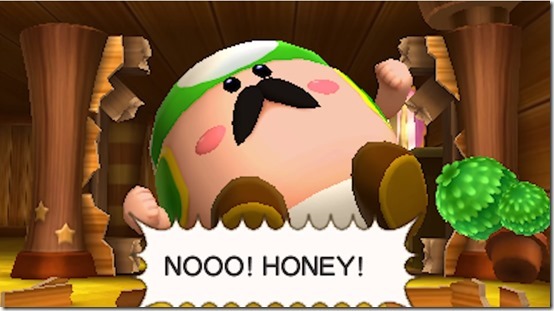 Nintendo have stopped incorporating 3D in most of the newer 3DS releases, but I feel the omission in this game is bizarre, as there are plenty of awesome looking 3D cutscenes that are seemingly tailor-made for stereoscopic 3D. Mario & Luigi: Bowser’s Inside Story + Bowser Jr.’s Journey is undoubtedly a great game, but it’s only the Bowser’s Inside Story segment that truly is a must play. The new Bowser Jr’s Journey game mode may not hold a candle to Bowser’s Inside Story, but the package overall is still truly brilliant. Bowser’s Inside Story has a quality story, quirky and charming characters and excellent turn based gameplay, whilst Bowser Jr.’s Journey feels much like an afterthought with strategic gameplay that I couldn’t help feel was uninspired, despite the engaging narrative. Regardless of Bowser Jr.’s Journey’s mediocrity, Bowser’s Inside Story + Bowser Jr.’s Journey is still a hard compilation to pass up, irrespective of whether you’ve played Bowser’s Inside Story before, and I recommend you pick this up for the Bowser’s Inside Story mode alone.